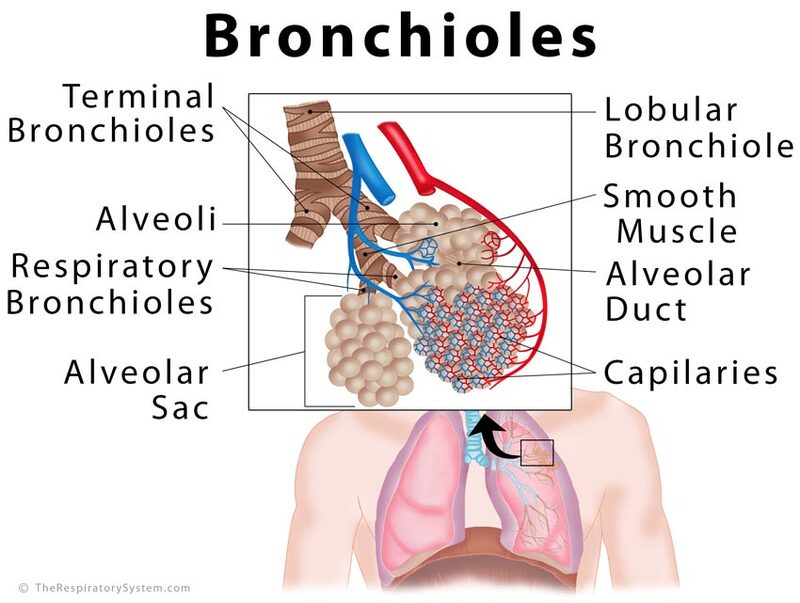 The smallest airways within the lungs that are not encircled by any cartilage are called bronchioles . Once the trachea divides into the left and right primary bronchi, they then branch into smaller and smaller divisions to lead to bronchioles. The trachea, bronchi, bronchioles, and alveoli all make up the lower respiratory tract . 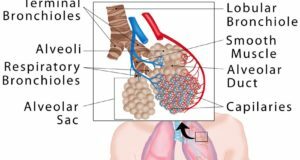 Each lung has around 30,000 bronchioles . 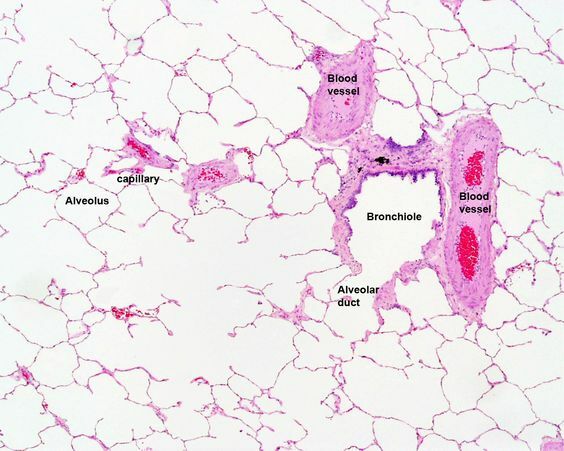 Located within the lungs, bronchioles are tubular structures around 1mm in diameter , consisting of connective tissues and some smooth muscles that keep the tubes open. These further divide into smaller tubules, which in turn continue subdividing till they reach the alveoli. Most parts of the bronchioles are lined with ciliated pseudostratified columnar or cuboidal epithelial tissues containing goblet cells. 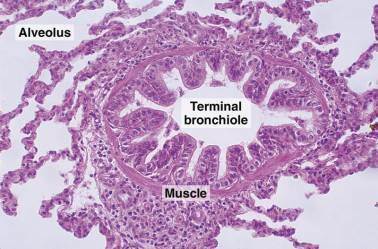 Also called preterminal bronchioles, each lobular bronchiole branches into multiple terminal bronchioles after passing into a pulmonary lobule . The final division of bronchioles, these end in 2-11 alveolar ducts [7, 8], surrounded by the proteins elastin and collagen, and smooth muscles, each leading into an alveolar sac. These sacs contain multiple alveoli, encircled by pulmonary system blood vessels . Ciliated cuboidal epithelial cells line the respiratory bronchioles, while some non-ciliated cells, known as clara cells, are present as well . Any dust particles and germs present in the inhaled air stick to the mucus secreted by the goblet cells in the epithelium, so the cilia can ‘sweep’ it upward to be excreted through the oral or nasal cavity . As the oxygen-rich inhaled air reaches the lungs through the bronchi, it travels via bronchioles to reach the alveoli, where the gas exchange (oxygen moving into blood, and carbon dioxide moving into the alveoli to be carried out during exhalation) occurs . The bronchioles play a most important role in the respiratory system by making sure each and every alveolus is supplied with oxygen . Bronchiolitis: A common infectious condition that causes swelling and inflammation of the bronchioles, and may affect the lungs in some cases. It often leads to coughing, congestion, and difficulty breathing due to an accumulation of mucus that blocks the airways. Bronchiolitis usually affects infants and toddlers below 2-3 years of age . Bronchiectasis: Characterized by permanent damage and dilation of the bronchi and bronchioles, it may occur as a result of certain genetic disorders, abnormal immune system functioning, and allergies of the lungs. Symptoms include a chronic cough, chest pain, wheezing, shortness of breath, and fatigue. It is incurable, but proper management enables an affected individual to lead a normal life . Bronchospasm: A sudden constriction of the walls of bronchi and bronchioles, often occurring due to chronic asthma and allergies, it may cause wheezing, shortness of breath, coughing, and chest tightness. Treatment involves managing the underlying condition and avoiding triggering factors [14, 15]. Emphysema: A type of chronic obstructive pulmonary disease (COPD), it is characterized by inflammation of the airways within the lungs that makes the bronchioles lose their elasticity and collapse during breathing. The inhaled air then gets trapped within the alveoli, resulting in difficulty breathing . Smoking is considered the primary cause of the condition with treatment involving medications to open up the passages and avoiding triggers .